Posted by Wairimu in Meats, What's cooking? Having a busy Monday today on the interweb today! It is a new week, and that means new recipes to try out for the bosses. Cook the chicken in a medium pan over medium heat, until no longer pink and starting to brown. Add the onion, sour cream,1/4 of the cheese, parsley, oregano and pepper. Cook this until cheese melts. Stir in salt, tomato sauce, water, chilli powder and garlic. Roll even amounts of the mixture in the tortillas. Arrnage in a baking dish. 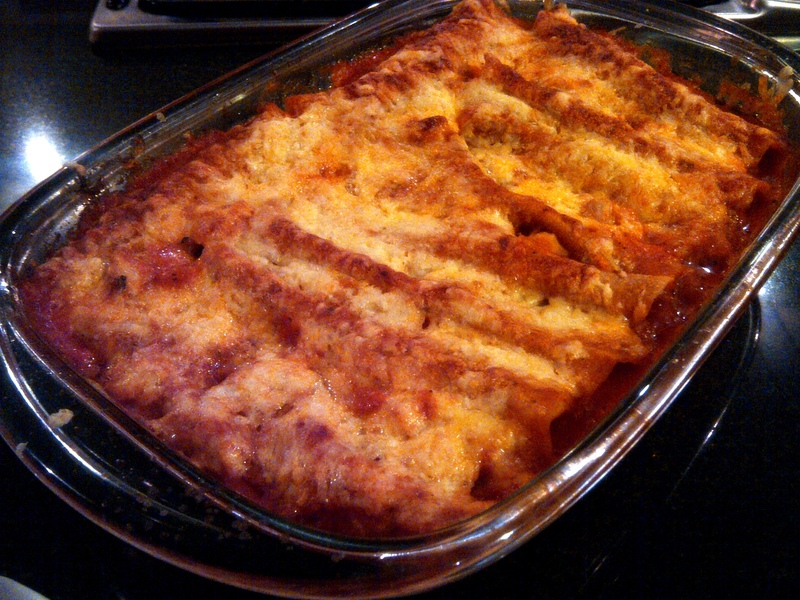 Cover with the enchilada sauce, and remaining sauce from the pan. Sprinkle with the rest of the cheddar cheese. Bake uncovered for 20 minutes. Cool for 10 minutes before serving. I served it with a salad today. The crispness of a salad and the creaminess and richness of the dish work perfectly!